Anti condensation heaters have to be installed to prevent moisture build-up on electric windings of rotating electrical equipment during off time. They also benefit by ensuring warm start-ups, extended bearing life and add freeze protection to the motors. Typical applications include electric motors, generators and alternators which operate in damp or wet conditions, e.g. offshore, shipboard and marine equipment, dockside cranes, well pumps and all equipment operating in a tropical environment. Specifying anti condensation heaters at the design stage can save the expense of costly rewinding and down time. Some motor manufacturers use metal or ceramic cartridge heaters for this purpose. Since such heaters are small due to space limit, they must operate at a high surface watt density and consequently high temperature. The high temperature causes rapid heater failure, often within the first year. 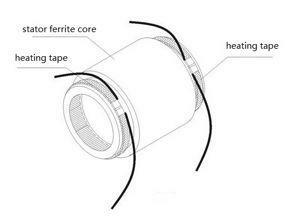 To reduce the heater failure rate, silicone heating tapes are used by smart motor manufacturers. The moisture-proof silicone rubber heaters are designed with low surface watt density by providing a large surface area. The flexible motor heaters are cool enough to be touched with bare hands without being burned. The life of these heaters typically exceeds the life of the motors. Heating tape enjoys another advantage over metallic or ceramic heaters. Because they are applied directly to the winding end turns, it is usually possible to achieve the required condensation prevention with a lower power consumption. Width of the tape: 1" or 2"
Size 1"x5" 1"x10" 1"x15" 1"x20" 1"x25" 1"x30" 2"x15" 2"x20" 2"x30" 2"x40"
Customized specification and marking are possible. We also supply various temperature sensors for motor protection, e.g. film pt100, three phase thermistor etc. Feel free to contact us if you have such demand. Condensation problem in motors can be solved by maintaining motor winding temperature 5-10°C above the surrounding air temperature. You can calculate the approximate wattage required by using the equation W=2DL, where "W" is the heat in watts, "D" is the outside diameter of the stator lamination in inches, and "L" is the length of the stator core in inches. Large motors (≥H315) often require one heating tape in each end (watts calculated above should be divided on each heater). DC Motors may take 50 to 100% more heat to keep them dry. Ideally the heating tape length should be close to the perimeter of the motor end. However overlap is absolutely forbidden. Flexible heating tapes can be laced to the outside diameter of the end turns of varnished windings. Heater leads are brought out through the motor terminal box and connected to the available single phase power supply. A heater is typically activated by means of a motor control circuit relay contact, which energizes the heater when the motor power is disconnected. Timers sometimes are used.